Adventures in the Endless Pursuit of Entertainment: Puppies, Kitties, Bernadette Peters: Broadway Barks is today! 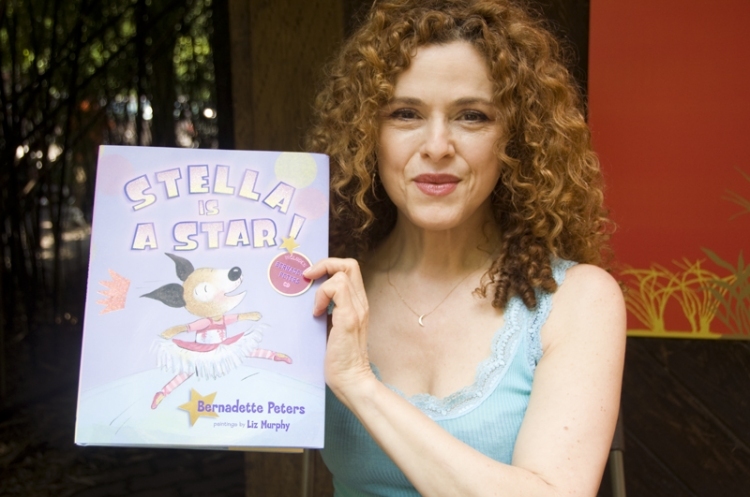 Puppies, Kitties, Bernadette Peters: Broadway Barks is today! Yesterday, the eve of Broadway Barks 13, was one of the hottest, swampiest, rainiest days of the summer in New York City. I just happened to run into Bernadette Peters at a restaurant and asked her if the show would go on, considering the weather. She was quick to assure me that the weather would be perfect! I think she's right - today is turning out to be beautiful - in the 80s with sunshine and low humidity. 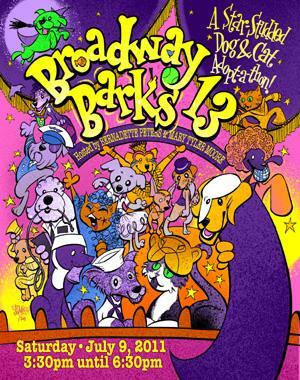 Bernadette Peters, along with Mary Tyler Moore, is the founder of Broadway Barks. Broadway Barks promotes animal adoption and raises money and awareness for no-kill shelter animals. Over the last 13 years, 1,000s of pets have been adopted and millions of dollars raised in support of pet adoption and no-kill shelters. Bernadette works tirelessly, even taking time to visit animals at these shelters and helping some to find them temporary shelter in order avoid euthanasia. Today the tradition continues in Shubert Alley in the heart of Broadway - it's the alley between 44th and 45th Streets, just west of Broadway. At noon, Bernadette will be signing her two best-selling children's books, Broadway Barks and Stella is a Star , both inspired by her own adopted dogs, Kramer and Stella. Beginning at 3:00 pm, dogs and cats from over 25 New York City area animal shelters will arrive in hopes of attracting a new home. At 5:30, many of these adoptable pets will be presented by Broadway actors, including Nick Adams, Nina Arianda, Heidi Blickenstaff, Steel Burkhardt, Kerry Butler, Norbert Leo Butz, Bobby Cannavale, Reeve Carney, Victoria Clark, Jennifer Damiano, Paige Davis, Matt DeAngelis, Sutton Foster, Adam Godley, Joel Grey, John Benjamin Hickey, Jackie Hoffman, Nikki M. James, Isabel Keating, Josh Lamon, John Larroquette, Beth Leavel, Joe Mantello, Michael McGrath, Judy McLane, John McMartin, Patina Miller, Michael Mulheren, Bebe Neuwirth, Rory O’Malley, Brad Oscar, Patrick Page, Andrew Rannells, Paris Remillard, Elizabeth Rodriguez, Annabella Sciorra, Alexandra Silber, Kacie Sheik, Will Swenson, Aaron Tveit and Yul Vazquez. There is also a raffle for cool prizes as well as a silent auction of celebrity-autographed memorabilia. Funds raised from the raffle, silent auction, signed memorabilia sales and donations are distributed to the participating shelters and rescue groups and to the Picasso Veterinary Fund, which is administered by the Mayor’s Alliance for NYC’s Animals and provides grants to shelters and rescue groups to cover extraordinary veterinary costs. Broadway Barks is sponsored by the ASPCA and Newman's Own. Broadway Cares/Equity Fights AIDS is the producer of Broadway Barks.